Recently I reviewed Rogue's Brutal IPA, which was delicious, yes, but did not live up to its name. Today, I'm reviewing Rogue's Chipotle Ale, an ale brewed with smoked jalapenos (aka. chipotles). When I purchased this bottle, I really had high hopes. Like I've said before, Rogue makes some great beer so I was expecting this to not disappoint. I had heard of chipotle and other pepper, or chile/hot beer in the past, but had yet to try one. Drink This: if you want to waste some money on a beer you think is going to be flavorful. 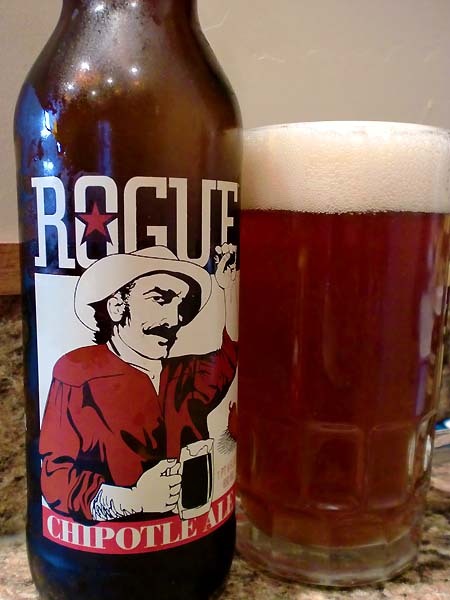 Personally, I'd rather drink Rogue's Dead Guy Ale any day, even though that is still quite average by my standards. Don't Drink This: if like me, you are hoping for a peppery, spicy, flavorful brew.